The Great Proletarian Cultural Revolution, better known simply as the (Chinese) Cultural Revolution(文革 - wéngé), was a massive social upheaval from 1966 through 1976 brought on by a struggle for power within the Communist Party of China, in which at least half a million people died and the People's Republic of China was brought to the brink of civil war. 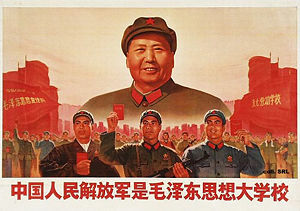 The Cultural Revolution was initiated by Party Chairman Mao Zedong in 1966 to reassert his leadership after the disasters of the Great Leap Forward which led to a loss of power to reformist rivals such as Liu Shaoqi. Between 1966 and 1968, Mao's principal lieutenants, Defense Minister Lin Biao and Mao's wife Jiang Qing, organized a mass youth militia called the Red Guards to overthrow Mao's enemies and purge the state apparatus of "capitalist roaders." In the chaos and violence that ensued, much of China's artistic legacy was destroyed, millions were persecuted, some of whom lost their lives. Although the Red Guards were disbanded in 1969, the Cultural Revolution continued during the period between 1969 and the arrest of the so-called Gang of Four in 1976. 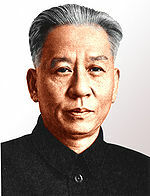 In the interim, Lin Biao mysteriously died in an airplane crash after being accused of attempting to overthrow Mao in a coup, many other officials were purged, the Chinese educational system was brought to a standstill as students were sent to rural communes, and technological advancement ground to a halt as ideology took precedence over expertise. The official Chinese view separates Mao's "mistakes" during the Cultural Revolution from his earlier heroism and general theories on Marxism-Leninism. 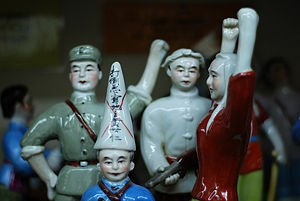 The Cultural Revolution thus remains a sensitive issue within the China today. Historical views which run counter to the official version – either by suggesting that the Cultural Revolution was a good thing or that Mao was either more or less culpable than the official history indicates – are routinely censored. 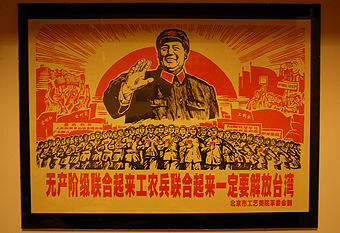 In 1957, after China's first Five-Year Plan, Mao Zedong called for an increase in the speed of growth of "socialism." Mao thus launched the Great Leap Forward, establishing special communes in the countryside and instituting a nationwide program of steel production using backyard furnaces. Industries soon went into turmoil as peasants were producing too much steel, which was often of very poor quality, while other areas were neglected. Farming implements like rakes and shovels were melted down for steel, impeding agricultural production. To make matters worse, in order to avoid punishment, local authorities frequently over-reported production numbers, which hid the seriousness of the problem. With the country having barely recovered from decades of war, the Great Leap Forward left the Chinese economy in shambles. Mao admitted serious negative results and called for dismantling the communes in 1959. However, he insisted that the Great Leap was 70 percent correct overall. In the same year, Mao resigned as chairman of the People's Republic, and the government was subsequently run by reform-minded bureaucrats such as People's Republic Chairman Liu Shaoqi, Premier Zhou Enlai, and General Secretary Deng Xiaoping. Mao, however, remained as chairman of the Chinese Communist Party. During this period, Mao formed a political alliance with Liu Shaoqi and Deng Xiaoping. Among Liu's and Deng's reforms were a retreat from collectivism, which had failed miserably. These moves away from the crippling effects of the Great Leap Forward however, did not result in an improvement in the lives of the Chinese people. The nation was now faced with the so-called "Three Years of Natural Disasters," which made recovery even more difficult. Food was in desperate shortage, and production fell dramatically, as much due to lasting effects of the failed Great Leap Forward campaign as to natural causes. An estimated 38 million people died from widespread famine during these years. In response, Liu Shaoqi developed a policy to move more dramatically away from Maoist policies of collectivism and state socialism. The success of his economic reforms won Liu prestige in the eyes of many Party members. Together with Deng Xiaoping, Liu began planning to gradually retire Mao from any real power, and to turn him into a figurehead. The reformers, however, faced opposition from Maoist hardliners, and Mao, fearing an abandonment of his revolutionary principles, initiated the Socialist Education Movement in 1963 to restore his political base and renew "revolutionary spirit," especially among the youth. Mao soon began criticizing Liu Shaoqi openly. By 1964, the Socialist Education Movement had become the new "Four Cleanups Movement," with the stated goal of the cleansing of politics, economics, ideas, and organization. The movement was directed politically against Liu and his allies. In late 1959, Beijing Deputy Mayor Wu Han had published an historical drama entitled "Hai Rui Dismissed from Office," in which a virtuous official (Hai Rui) was dismissed by a corrupt emperor. The play initially received praise from Mao, but in 1965, his wife, Jiang Qing, published an article criticizing the play together with her protégé Yao Wenyuan. They labeled it a "poisonous weed" and an attack on Mao. The Shanghai newspaper article received much publicity nationwide. In response, Beijing Mayor Peng Zhen, a supporter of Wu Han, established a commission to study the issue, finding that the criticism had gone too far. In May, 1966, Jiang Qing and Yao Wenyuan published new articles denouncing both Wu Han and Peng Zhen. Then, on May 16, following Mao's lead, the Politburo issued a formal notice criticizing Peng Zhen and disbanding his commission. Soon, the Politburo launched the Cultural Revolution Group. 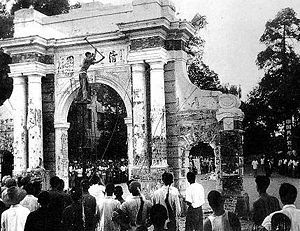 Students and Tsinghua University attack the old Tsinghua Gate, which would later be rebuilt. Lin Biao, who would become a primary organizer of the Cultural Revolution, declared: "Chairman Mao is a genius, everything the Chairman says is truly great; one of the Chairman's words will override the meaning of ten thousands of ours." Soon, popular demonstrations were launched in support of Mao and in opposition to the reformers. On May 25, a young teacher of philosophy at Beijing University, Nie Yuanzi, wrote a dazibao ("big-character poster") labeling the director of the university and other professors as "black anti-Party gangsters." Some days later, Mao ordered the text of this big-character poster to be broadcast nationwide. On May 29, 1966, in the middle school attached to Beijing's Tsinghua University, the first organization of Red Guards was formed, aimed at punishing and neutralizing reform-minded intellectuals and officials. On June 1, 1966, the official People's Daily Party newspaper stated that all "imperialistic intellectuals" and their allies must be purged. On July 28, 1966, representatives of the Red Guards wrote a formal letter to Mao, arguing that mass purges and related social and political phenomena were justified; and committing themselves to this effort. In an article entitled "Bombard the Headquarters," Mao responded with full support. Thus the Cultural Revolution began in earnest. 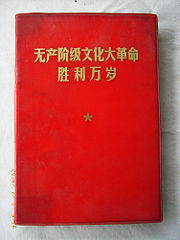 Chinese propaganda book entitled "Long Live the Great Proletarian Cultural Revolution"
The policy expanded the existing Red Guards student movement and elevated it to the level of a nationwide mass campaign, calling not only students but also "the masses of the workers, peasants, soldiers, revolutionary intellectuals, and revolutionary cadres" to carry out the task by writing big-character posters and holding "great debates." The decision granted extensive freedom of speech to criticize those in authority and unleashed millions of young people who had been intensely indoctrinated in Maoist thought since the establishment of the PRC. Red Guard units were formed throughout the country, throwing the universities into turmoil and threatening politicians deemed to be "capitalist roaders." Beginning August 16, 1966 millions of Red Guards from all over the country gathered in Beijing to see the great Chairman Mao. From the top of the Tiananmen Square gate, Mao and Lin Biao made frequent appearances to approximately 11 million adoring Red Guards. Mao praised their actions in the recent campaigns to develop socialism and democracy. For two years, until July 1968 (and in some places much longer), Red Guards and other student activists expanded their areas of authority. They began by passing out leaflets and posting the names of suspected "counter-revolutionaries" on bulletin boards. They assembled in large groups, held "great debates" in which Mao's enemies and their own professors were bitterly criticized, and staged numerous "revolutionary" plays. The debates soon evolved in public "struggle sessions" of criticism and coerced "self-criticism" from suspected counter-revolutionaries. Although the 16 Points forbade "physical struggle (武斗)" in favor of "verbal struggle" (文斗), the above-mentioned "struggle sessions" often led to physical violence. Party efforts to curb the violence stopped short of police action, and sometimes appeared to encourage "physical struggle." On August 22, 1966, Mao issued a public notice which forbade "all police intervention in Red Guard tactics and actions." Those in the police force who dared to defy this notice, were labeled "counter-revolutionaries." In September, all Red Guards were encouraged to come to Beijing over a stretch of time, giving Mao's further imprimatur to their actions. Their fees, including accommodation and transportation, were to be paid by the government. On October 10, Lin Biao publicly criticized Liu and Deng as "capitalist roaders" and "threats," setting the stage for a widespread purge of the Party. 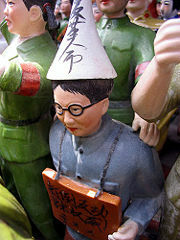 Former defense minister Peng Dehuai, an early critic of the Great Leap Forward and a rival of Lin, was brought to Beijing to be publicly displayed and ridiculed. He was then purged from the Party. On January 3, 1967, Lin Biao and Jiang Qing collaborated to launch the "January Storm," in which many prominent Shanghai, municipal government leaders were publicly criticized and purged. As a result, Jiang's partner Wang Hongwen rose to power in the city and its CCP apparatus. In Beijing, Liu and Deng were once again the targets of criticism. This began a major political struggle among central government officials, who seized the Cultural Revolution as an opportunity to accuse their rivals of "counter-revolutionary activity." A similar phenomena emerged among local Party cadres. On January 8, Mao once again praised the struggle against the "capitalist roaders" in a People's Daily editorial, urging all local governmental leaders to engage in "self-criticism," and in the criticism and purging of others. Purge after purge followed in China's local governments, some of which stopped functioning altogether. Involvement in some sort of public "revolutionary" activity was essential to avoid being purged, and it, too, was no guarantee. At the same time, major Red Guard organizations, sometimes well armed, now began turning against each other in factional struggles and attempts to prove which units were the most revolutionary. On April 6, Liu Shaoqi was openly and widely denounced by the large Zhongnanhai Red Guard faction. This was followed by a counter-protest and mass demonstrations, most notably in Wuhan on July 20, which dared to denounce Jiang Qing's behavior as "counter-revolutionary activity." She quickly flew to Wuhan to criticize the general in charge of the Wuhan area, Chen Zaidao, and on July 22, Jiang Qing took the bold step of directing the Red Guards to replace the People's Liberation Army when needed. Red Guard units began seizing weapons from local armories, and violence escalated. In the spring of 1968, a massive campaign promoted the already-adored Mao Zedong to a god-like status. Hundreds of millions of copies of Mao's Little Red Book were published and posters depicting him in messianic poses became ubiquitous. At the same time, a consensus began to develop in the Party that the Red Guards were going too far, and that the military must establish order. On July 27, the Red Guards' power over the army was officially ended and the central government sent in units to protect many areas still being targeted by Red Guards. A year later, the Red Guard factions were dismantled entirely. In any case, from Mao and Lin's point of view, their purpose had been largely fulfilled. In early October, Mao began a purge of national level Party officials. Many were sent to the countryside to work in labor camps. In the same month, at the Twelfth Plenum of the Eighth Party Congress, Liu Shaoqi was "forever expelled from the party," and Lin Biao was made the Party's Vice-Chairman, second only to Mao. Liu Shaoqi was sent to a detention camp, where he died in 1969. 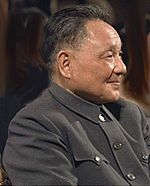 Deng Xiaoping, was sentenced to a period of re-education three times and eventually found himself working in an engine factory, until he was brought back years later by Zhou Enlai. Most of those accused were not so lucky, and many of them never returned. In December 1968, Mao began the "Down to the Countryside Movement," which lasted for the next decade. "Young intellectuals" living in cities were ordered to the countryside. Most of these were recently graduated middle-school students. This move was largely a means of moving Red Guards out of the cities to the countryside, where they would cause less social disruption, although it was explained in terms of creating revolutionary consciousness by putting these city-bred students in touch with manual labor. The educational system in the cities was brought to a virtual standstill. On April 1, 1969, at the CCP's Ninth Congress, Lin Biao officially became China's second in command, while still holding charge of the Army. With Mao aging, Liu Shaoqi already purged, and Zhou Enlai's influence fading, his power appeared to be unrivaled. The Party constitution was modified to designate Lin as Mao's official successor. Henceforth, at all occasions, Mao's name was to be linked with Lin's. Lin also held a place on the Politburo's powerful Standing Committee together with Mao, Chen Boda, Zhou Enlai, and Kang Sheng. On August 23, 1970, at the Second Plenum of the CCP's Ninth Congress, a controversy developed over the issue of the restoration of the position of President of the People's Republic of China|State President]], which Mao had previously abolished. Chen Boda, who had spoken in favor of restoring the office, was removed from the Standing Committee, a move which was also seen as a warning to Lin Biao. Mao began to suspect Lin of wanting supreme power and intending to oust Mao himself. Subsequent events are clouded by divergences between official versions, which focus on Lin's attempt to oust Mao, and alternative accounts which view Mao as increasingly paranoid and conspiring with his allies to do away with Lin. In the official account, Lin now moved to use his military power organization in a coup. Assassination attempts were reportedly made against Mao in Shanghai, from September 8 to September 10, 1971. After this, nearly continuous reports circulated of Mao being attacked. One of these alleged a physical attack on Mao en route to Beijing in his private train. Another alleged that Lin had bombed a bridge that Mao was scheduled to cross to reach Beijing. Whether or not these reports had a basis in fact, after September 11, 1971, Lin Biao never appeared in public again, nor did his primary backers, many of whom attempted to escape to Hong Kong. Most failed to do so and about 20 army generals loyal to Lin were arrested. Official reports hold that on September 13, 1971, Lin Biao and his family attempted to flee to the Soviet Union, but their plane crashed in Mongolia, killing all on board. On the same day, the Politburo met in an emergency session. Only on September 30 was Lin's death was announced in Beijing, and a campaign was launched which would effectively discredit him as a power-hungry traitor who had attempted to use Mao and the Cultural Revolution for his own purposes. The exact cause of the plane crash remains a mystery. Mao had been severely shaken by the Lin Biao affair and also needed a new succession plan. In September 1972, Shanghai leader Wang Hongwen was transferred to work in Beijing for the central government, becoming the Party Vice-Chairman in the following year. At the same time, under the influence of Premier Zhou Enlai, Deng Xiaoping was rehabilitated and transferred back to Beijing. In late 1973, however, Jiang Qing and her three main backers—Wang Hongwen, Zhang Chunqiao, and Yao Wenyuan—launched the Pi-Lin Pi-Kong campaign, which translates as "Criticize Lin, Criticize Confucius." Its prime target was Zhou Enlai. Zhou came to be characterized as having Confucianist tendencies because of his emphasis on Party bureaucracy rather than continued mass revolution. Although Zhou Enlai's name was never directly mentioned during this campaign, his historical namesake, the ancient Duke of Zhou, was a frequent target. In October 1973, Zhou became gravely ill and was admitted to a hospital. Deng Xiaoping was named First Vice-Premier and took charge of the daily business of the Party's state apparatus. Deng continued to expand Zhou's policies, while the "Criticize Lin, Criticize Confucius" campaign failed to gain much momentum as a popular movement. In September 1975, Mao himself was also admitted into the hospital with a serious illness. On January 8, 1976 Zhou Enlai died of bladder cancer, and Deng Xiaoping delivered Zhou's official eulogy. In February, Jiang Qing's group, known by their enemies as the "Gang of Four" began to target Deng. On Mao's authority, Deng was once again demoted. However, Mao resisted selecting a member of the Gang of Four to become premier, instead choosing the relatively unknown Hua Guofeng. With the main Party apparatus still in control and no mass Red Guard-type movement to support the Gang of Four's campaign, popular opinion rallied around Zhou Enlai as a symbol of rational leadership. On April 5, China's traditional day of mourning, an estimated two million people gathered in and around Tiananmen Square in honor of Zhou, turning the assembly into a protest against the Gang of Four. Police were ordered to enter the area, clear the wreaths and political messages, and disperse the crowds. The Gang of Four pointed to Deng Xiaoping as the planner of this expression of public dissatisfaction. On September 9, 1976, Mao Zedong died. Before dying, Mao had written a note to Hua Guofeng stating: "With you in charge, I'm at ease." Hence, Hua became the Party's chairman. Hua had been previously considered to be lacking in political skill and ambition, and seemed to pose no threat to the Gang of Four in the power succession. However, Hua now proved to be capable of decisive action. Encouraged by prominent generals like Ye Jianying and supported both by the Army and Deng Xiaoping's allies in the Party, Hua ordered the arrest of the Gang of Four. Their arrest brought the Cultural Revolution to its final end. Despite staving off the Gang of Four, Hua Guofeng continued to invoke Mao's name and cult of personality to justify his policies. He thus launched the so-called "Two Whatevers," saying "Whatever policy originated from Chairman Mao, we must continue to support," and "Whatever directions were given to us from Chairman Mao, we must continue to work on their basis." In economic policy, Hua intended to move the Chinese system toward the Soviet-style planning of the early 1950s. Under pressure from other Party leaders, Hua also decided to bring Deng Xiaoping back into regular state affairs, naming him Vice-Premier of the State Council in July 1977 and later to various other positions. In August, the Party's Eleventh Congress was held in Beijing, officially naming (in ranking order) Hua Guofeng, Deng Xiaoping, Ye Jianying, Li Xiannian, and Wang Dongxing as members of the Politburo Standing Committee. Deng gradually consolidated his power base, and on July 1, 1978 he publicized Mao's self-criticism report of 1962 regarding the Great Leap Forward. On this foundation, in September 1978, he began to openly attack Hua Guofeng's "Two Whatevers." On December 18, 1978, at the Third Plenum of the Eleventh CCP Congress, Deng stated that "a liberation of thoughts" was needed within the Party. Hua Guofeng was required to engage in self-criticism, stating that his doctrine of the "Two Whatevers" was wrong. The Tiananmen Square incident in support of Zhou Enlai was politically rehabilitated, and even Liu Shaoqi was allowed a belated state funeral. In the Fifth Plenum of the Eleventh CCP Congress, held in 1980, many other Party members who had been purged during the Cultural Revolution were rehabilitated. Hu Yaobang was named General-Secretary and Zhao Ziyang, another of Deng's protégés, was named into the Central governing apparatus. In September, Hua Guofeng resigned, with Zhao Ziyang being named the new Premier. Deng added to his portfolio the chairmanship of the Central Military Commission. By this time, Deng was the foremost and paramount figure in Chinese politics, Mao's infallibility was officially rejected, and the Cultural Revolution firmly discredited. 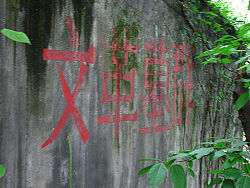 The central section of this wall shows the faint remnant marks of a propaganda slogan that was added during the Cultural Revolution, but has since been removed. The slogan reads "Boundless faith in Chairman Mao." The Cultural Revolution directly or indirectly touched essentially all of China's populace. During this period, much economic activity was halted, with "revolution" being the primary objective. 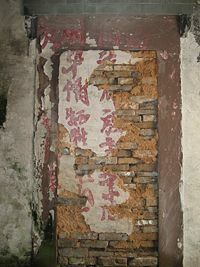 Countless ancient buildings, artifacts, antiques, books, and paintings were destroyed by Red Guards. The ten years of the Cultural Revolution also brought the education system to a virtual halt. University entrance exams were canceled, only being restored by Deng Xiaoping in 1977. Many intellectuals were sent to rural labor camps, and those with academic skills and technical expertise became the primary targets of political "struggle" at the local level. Mao Zedong Thought thus became the central operative guide to all things in China. In the Cultural Revolution's early years, authority of the Red Guards surpassed that of the army, local police authorities, and the law in general. Young people were encouraged to challenge and even inform on their parents and teachers, with the one exception of Chairman Mao, whose teachings were beyond question. The Cultural Revolution also brought to the forefront numerous internal power struggles within the Chinese Communist Party, resulting in local factionalism and petty rivalries. Armed members of opposing factions often fought on the streets, and political assassination, particularly in the rural provinces, was common. China's historical reserves, artifacts and sites of interest suffered devastating damage as they were thought to be at the root of "old ways of thinking." Many artifacts were seized from private homes and often destroyed on the spot. Western observers suggest that much of China's thousands of years of history was obliterated, and that such destruction of historical artifacts is unmatched at any time or place. The Cultural Revolution was particularly devastating for minority cultures in China. This reportedly stemmed in part from Jiang Qing's personal animosity toward ethnic minorities. "The centrality of the Han ethnic group" was a major theme throughout this period. At the same time, the campaign aimed to bring restless ethnic regions under control of the Han-dominated central government. In Tibet, over 2,000 monasteries were destroyed, although often with the complicity of local ethnic Tibetan Red Guards. In Inner Mongolia, many people were executed during a ruthless campaign to expose supposed members of the "separatist" Inner Mongolian People's Party. In Xinjiang, Uyghur Muslim imams were publicly humiliated for their "counter-revolutionary" faith, while copies of the Qur'an were publicly burned. In the ethnic Korean areas of northeast China, Korean language schools were destroyed and many killings reported. In Yunnan Province, the palace of the Dai people's king was torched, and an infamous massacre of Hui Muslims at the hands of the People's Liberation Army claimed over 1,600 lives in 1975. The human rights of literally hundreds of millions of people were annulled during the Cultural Revolution. People were forced to walk through the streets naked and flogged publicly. Many deaths occurred in police custody, often covered up as "suicides." Numerous individuals were accused, often on the flimsiest of grounds, of being foreign spies. To have, or have had, any contact with the world outside of China, could be extremely dangerous. Millions were displaced as young people from the cities were forcibly moved to the countryside, where they had to abandon all forms of standard education in favor of Maoist propaganda. Estimates of the death toll, including civilians and Red Guards, are about 500,000 from 1966—1969. In the trial of the so-called Gang of Four, a Chinese court figured that 729,511 people had been persecuted of which 34,800 were officially admitted to have died. The true figure may never be known, since many deaths went unreported or were covered up by local authorities. To this day the China refuses to permit serious scholarly research into the period. This page was last modified on 24 November 2017, at 20:34.